With a new petition, Pitt professors are asking the administration to proactively protect undocumented students. Assistant English professor Peter Campbell and English professor Sarah Leavens spearheaded the effort and worked collaboratively with seven other professors on the petition, which urges Pitt Chancellor Patrick Gallagher and Provost Patricia Beeson to declare Pitt a sanctuary campus. As a sanctuary campus, Pitt would not cooperate with immigration enforcement or deportation actions directed at Pitt students and faculty. A day after the petition went up as a Google Forms doc on Dec. 6, more than 379 Pitt students, alumni and faculty had signed. Leavens said the petition came about because the professors involved had seen and heard threats — referring to Donald Trump’s promises to deport undocumented immigrants — that put members of Pitt’s community in danger. “Colleges are supposed to be welcoming and encouraging places, and those statements and actions that have happened here have directly put our students at risk,” Leavens said. According to the Center for Immigration Studies, Pittsburgh and other cities in California, Connecticut, New Mexico and Colorado are some of the 300 “sanctuary” jurisdictions across the United States. Sanctuary cities typically do not prosecute people solely for being an illegal immigrant in the city which the person is currently living and refuse to enforce national immigration laws, though practices vary across cities. While Pittsburgh has acted as a sanctuary city since 2014, it has not yet formally passed any laws to ensure protections for undocumented immigrants. PublicSource reported on Nov. 29 that Pittsburgh City Council members have a policy in the works. Protests related to immigration and calls or sanctuary campuses and cities across the country have sparked in response to President-elect Donald Trump’s 10-point immigration plan. The plan includes cutting federal funding to sanctuary cities as well as deporting undocumented immigrants who have committed crimes and building a wall along the U.S.-Mexico border. Monday’s petition asks Pitt to revise its non-discrimination policy to include immigration status as a protected category, to have Pitt police not inquire about a student’s immigration status, and to create a program for students who have issues with visa status, among other requests. Pitt spokesperson Joe Miksch said Pitt is aware of the petition effort, but would note offer more information on the matter. Pitt students previously asked Chancellor Gallagher to declare Pitt a sanctuary campus on Nov. 16, as part of a nationally organized campaign — National Walk-Outs for #SanctuaryCampus. 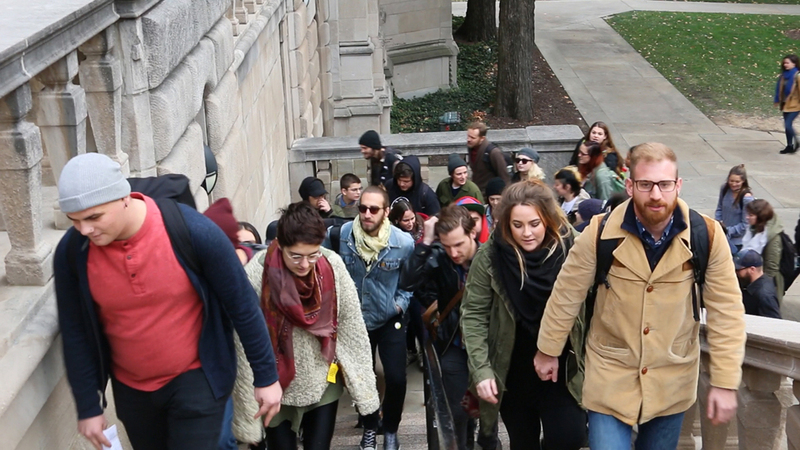 At that demonstration, between 50 and 60 Pitt students gathered in front of the Cathedral of Learning and gave Vice Chancellor Kathy Humphrey a letter asking to make Pitt a safe space for undocumented students. According to Miksch, Gallagher responded with a private letter to students, instructing them to set up a meeting with Dean of Students Kenyon Bonner. Since the letter was private, many professors and students have not heard Gallagher’s response. The petition, therefore, questions why they have not yet heard a response. “To the best of our knowledge the Chancellor’s office has yet to respond to the November letter and the walkout, and so that was kind of really the inspiration for us faculty putting this letter together,” Campbell said. Since Trump became president-elect on Nov. 8, students at dozens of universities across the United States have asked university administrations to establish their universities as sanctuary campuses. Wesleyan University’s student newspaper, the Wesleyan Argus, reported on Nov. 20, Wesleyan University President Michael Roth declared the university a sanctuary campus after consulting with the university’s Board of Trustees and legal counsel. The Los Angeles Times reported California State University Chancellor Timothy P. White reaffirmed on Nov. 16 the university would remain a “safe and welcoming” community for undocumented students at the university. Even without the designation as a sanctuary campus, Juan Sempértegui, a junior from Ecuador, said he feels comfortable on Pitt’s campus. Sempértegui, who is not an undocumented immigrant and is in the United States on a scholarship from the Ecuador government, said Gallagher’s email after the election made him feel better about his place on campus as an immigrant in general. Although he does not have any fears for himself, he said he worries about other foreigners on campus and how safe they might feel. In his time at Pitt, he said he has felt as if Pitt treats him the same as every other student. Yet, if the administration did not declare Pitt a sanctuary campus, he would feel like he was here less because of what he could contribute to the community and the University and more for the money he was giving. “If Pitt is unwilling to use the word ‘sanctuary,’ they should respond to the specific calls from the letter,” Campbell said.